Can an exhaust system deliver enough power to literally knock your socks off? Let's just put it this way: when you equip your mean machine with Dynatech's SuperMAXX Exhaust System, you'd better lace up your driving shoes tight. Each system is custom engineered and dyno proven to unleash massive wallops of real, usable, seat-of-the-pants horsepower and torque across the power band. Your SuperMAXX Exhaust System doesn't just push the envelope of street performance-it air mails it to Timbuktu. 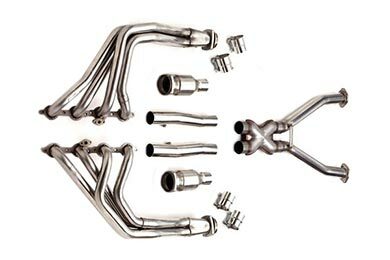 The potent combination of the SuperMAXX's long-tube headers and the high-flow catalytic converters boosts exhaust flow by up to 106%! Select systems even come with a NASCAR style X-pipe. Plus, the whole system is built to last from T-304 stainless steel. No chop jobs required-just unbolt your old exhaust manifolds and cats, then pop your shiny new SuperMAXX in its place. Your stock mufflers stay put, and you get triple-layer steel gaskets, clamps and mounting hardware. Because your SuperMAXX Exhaust System includes replacement performance catalytic converters, it is not street legal and is intended for off-road and racing vehicles. If you want some serious horsepower and torque and an extreme difference in performance and power out of your F-150 then get the Dynatech Supermaxx exhaust system...I did. I recommend this exhaust upgrade to anyone. I wanted to have a low quiet rumble at a idle, however if I jump on it I want you to know I am not playing. I live in a apartment complex and work nights. I cant bother the neighbors but I wanted a better sound and performance. The Dynatech Super Maxx gave me just that. Two thumbs up. I installed the Dynatech SuperMAXX headers at the same time as my Borla Cat back exhaust. There is a slight issue with marrying the two systems up, however, once the two were installed and i drove the vehicle it was well worth the headache. The hardest thing about the whole install was the removal of the old system...These Headers provide a great sound combined with a substantial power gain. You will definitely notice the change throughout the power range of the engine. I have already recommended these to several friends. Installation was a breeze for the headers all the way back. The kit is super quality and went together without a hitch. Reference # 764-433-707 © 2000-2019 AutoAnything, Inc.